Chapters will be awarded Bronze, Silver, or Gold status for total membership affiliation at State Leadership Conference. 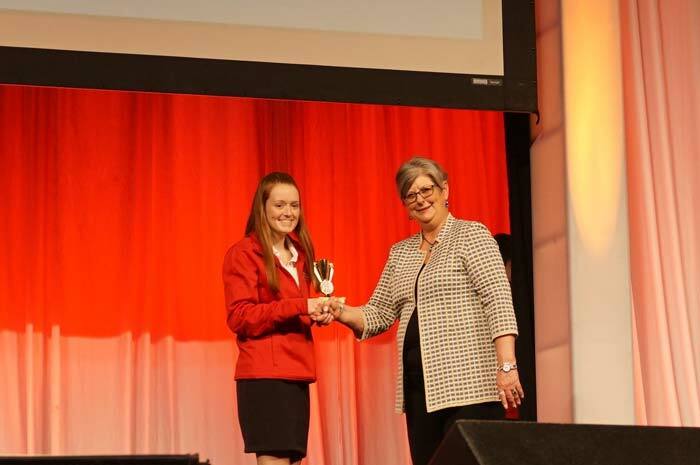 The Outstanding Chapter Award, Recognized chapters who plans and conducts a well-balanced Program of Work that supports strategic alignment with state and national Family, Career and Community Leaders of America (FCCLA). Is the highest Degree awarded in Ohio. Candidates must be a junior or senior in high school and have earned the Chapter Degree or Power of One and completed three courses in family and consumer sciences or related career field courses. The Chapter Degree is designed to promote individual growth. Any affiliated high school member may earn the Chapter Degree. The Chapter Degree is one of two options that must be completed before earning the State Degree. Must complete one semester of high school Family and Consumer Sciences course or related career field course. Must be awarded before June 1st, if the member plans to work toward the State Degree. A Power of One project is an individual activity you create to reach a personal goal. Your project should relate to subjects taught in Family and Consumer Sciences and FCCLA. Projects must involve in-depth effort. Each Power of One unit includes suggested projects. Feel free to adapt a project to your needs or develop your own project. Make sure your project relates to the unit and has been approved by your FCCLA adviser. A project used in other FCCLA activities may be adapted for Power of One as long as it is an in depth individual activity. For example, if you do a project on family councils in the Families First program, you can use parts of that project again in the Power of One unit, “Family Ties,” by holding family council meetings at home.